Product Safety | CS Packaging, Inc.
A frantic rush ensues to find boxes that appear to be the right size, but the effort to save a few pennies results in using packaging that just can’t do the job of protecting its contents. It arrives crushed at the customer’s location, to be followed shortly by an angry phone call back to the supplier. The job of selecting the right packaging should be considered as part of the entire production process. You want to find the perfect packaging to secure your contents safely inside and make a good impression for your company, but you don’t want to spend money on needless packaging when it’s not necessary. That’s why it is helpful to know about the differences between stock packaging and custom packaging boxes. This is packaging that pretty much comes ready-made right off the shelf from the packaging supplier. You put your product in, add some filler or bubble wrap to lessen movement, and slap a shipping label on it to send it off to the customer. Stock packaging is usually easy to find, and costs are relatively inexpensive, but there can be some limitations on size and style. When Should You Use Stock Packaging? It is also appropriate for lower-priced items such as food products or canned goods where there would not be a significant financial loss if the box or contents were damaged during shipping. What Are Custom Packaging Boxes? Custom packaging is when a box is engineered and produced to meet a specific product purpose. This may require “drop tests” to determine vulnerability, and may often require several prototypes before a final design is accepted. The packaging may also involve special tooling or dyes, and separate set-up costs as part of the manufacturing process. Sometimes a company wants to place a branding message on its packaging, which may involve the use of digital printing. Generally, custom packaging is more expensive, involves minimum order quantities, and takes some time to come up with the perfect package, but the end result is worth it when the product arrives safely and the box makes a good impression. When Should You Use Custom Packaging Boxes? If you’re shipping sensitive products or ones that are easily damaged, you know that shipping can be dangerous. Boxes are jostled on conveyor belts, thrown into trucks and sometimes dropped along the way. Unless you have complete control over the entire shipping process, it’s best to protect your product as much as possible with custom packaging boxes. The higher the product cost, the more you’ll need to look into custom packaging. If somebody is paying a good dollar for your product, they don’t want it delivered in a plain cardboard box! To make sure your products are properly protected at the lowest possible price, look for an independent packaging distribution company which can provide a wide variety of stock products as well as custom packaging boxes. “It’s what is inside that really counts.” Although we often say this about people, some manufacturers and distributors think the same way about product packaging. They pore over every product detail, and then ship it out in whatever box that is available, without any thought to protection or presentation. Ignoring custom shipping packaging, however, can have a negative impact on your brand and your bottom line. There are lots of people who will see your package, so why not use it to make a positive brand statement? If your product arrives damaged because the packaging did not perform its job, your company loses time in customer service and wastes the effort of sending a replacement. And this doesn’t take into consideration whether that person remains as a customer, or how many other people they tell about their “lousy” experience! There are two sides to custom packaging. One is the packaging itself, which needs to be constructed specifically for a particular product to protect it during the shipping process. A well-constructed package also makes a positive impression when end consumers first receive it. The other side of custom packaging is what it says to everyone who handles it. Your package may be handled by delivery people, sales people, warehouse workers and many others before it gets to the consumer. Use every chance to make a brand statement with digital printing on the outside of your box. What can this strategy do? Which Packaging Supplies Should Be Customized? Although tape doesn’t get a lot of attention, it can cause a lot of problems if it doesn’t hold the box closed. Once you’ve got the right tape strength for the job, print a logo on it to increase brand awareness. In addition to outside printing, the construction itself is crucial. You can order a special thickness for a custom-printed corrugated box that will keep your product safer. Custom retention packaging or foam packaging will protect sensitive products from shock and vibration. Custom partitions keep multiple products inside a box from bumping into each other and becoming damaged. Combined board or corrugated flutes can be customized to provide the necessary level of protection. These provide corner integrity with capacity from light to heavy duty. They can be printed with “Do not double stack” to further prevent crushing. Additionally, you’re custom shipping packaging supplies provider can ensure product safety with an edge crush test — making sure your box will not be easily damaged in transit. Glassware, wine bottles, and delicate electronic items are best protected by custom molded pulp trays or air cushion packaging, which creates a secure, resilient barrier between your product and its shipping container. Not Sure What to Customize? Although stock packaging has its place, you should definitely use custom shipping packaging supplies to make sure your products look their best and are properly protected whenever possible. Not sure what to customize for your business? Talk to one of our packaging experts! Every year, companies lose billions of dollars in merchandise during shipment. Most of the time, this is due to freight not being properly bonded to their pallets. However, sometimes a faulty load due to incorrect stacking is not the problem. Making sure that the packaging process is done correctly may avoid injuries for truck drivers and unloading personnel. There are steps you can take that can help reduce load damage. We’ve put together the most feasible ones that you can begin implementing today, ensuring product safety. It sounds simple, but knowing your pallets is at the top of the list because it is so important. Make sure that before loading every freight, every pallet is checked for broken or faulty planks, nails, and missing support blocks. This is a packaging solution that will prevent pallets to collapse when weight is put on it. It is also a way to avoid product damages and employee injuries when loading and unloading. This solution means you should take the time to stack and wrap each pallet. Figure out the best way to stack and load so the freight can get to its final destination without any issues. This stage is also the where you take a moment to search for the best packaging supplies. Boxes and wraps that will help create a more stable load while stacking the pallets. Make sure that the pallets can hold the weight of your merchandise. Lighting up the weight of each pallet saves both the energy of your employees and helps prevent merchandise damage. You can also check the Maximum Load per Carton that each of your boxes can carry with a simple Edge Crush Test. Taking time to calculate the weight capabilities of your pallets and boxes may seem cumbersome and time consuming during your shipping process, but it can save you thousands per year in damaged product. Taking the time to check off these steps will be the packaging solutions you have been searching for to reduce your load damage. Think of it this way. Why take the chance when there are simple, affordable and effective ways to increase your chances of the freight arriving safely? Let’s say you ordered some sort of expensive electronic product online, like a laptop. You’re obviously excited for it to arrive at your home, and you may have even thought about the perceived risk that you took in ordering it online rather than at the store. The risk we’re talking about? Shipping. Yes, product packaging isn’t too much of an issue for soft goods that are purchased online, but for expensive, fragile things like computers, it’s a different story. 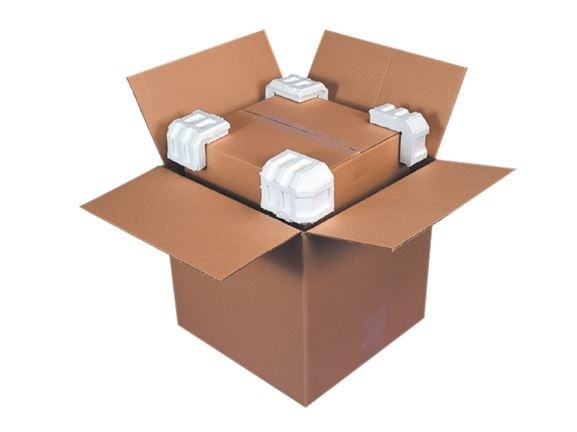 After all, packages get tossed around, might be dropped or even stacked on top of one another as they go from Point A to Point B. The last thing you want to do is have to worry about returning a damaged or busted product upon home delivery. And that’s where retention and suspension packaging come into play. How Does Suspension Packaging Work? Retention and suspension packaging uses special corrugated inserts and plastic flexible film. The inserts fit into the shipping box and work to suspend the product so that it’s more centrally located within the open airspace of the box and away from the major points of impact. 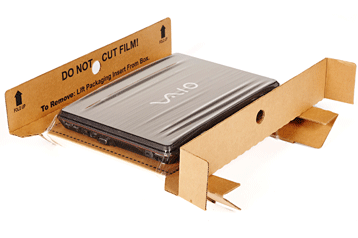 Additionally, the product is secured into place with plastic flexible film, which prevents it from slipping around or moving within the box itself. What Are the Benefits of Suspension Packaging? Is easy to assemble and install. There are several benefits to using retention and suspension packaging. For starters, it presents a more cost effective alternative to conventional means of secure shipping, which often involves the use of foam, die cut molds or other materials. Because products are secured in place with flexible plastic film, most retention and suspension packaging is a one-size-fits-all type of solution thanks to the conforming properties of the film itself. The flexible film used to hold products can be easily reused, as it maintains its effectiveness. Noting this, it’s a more eco-friendly option. On most packages you’ve opened over the years, you likely had to dig through the box and break apart foam to get to the product you bought. This creates a bit of a mess that you’re left to clean. When you open a box with retention and suspension packaging, you’re able to see the product right then and there as soon as the box is opened. There’s no digging around or messy cleanup. In fact, the corrugated retention inserts can be recycled too. Retention and suspension packaging is easy to assemble and install. Keeping your product safe is a top-priority for your business. If you’re looking to upgrade your packaging, but aren’t sure where to start — just call Bob!